For dinner one night our friend Frances made us one pot pasta - it was so easy & rich in flavor. Since then I have made it many times, with lots of variations. I prefer using linguini & I often make it for breakfast when I'm craving something savory. There are many different ways to make this dish, it all depends on what's in the house. 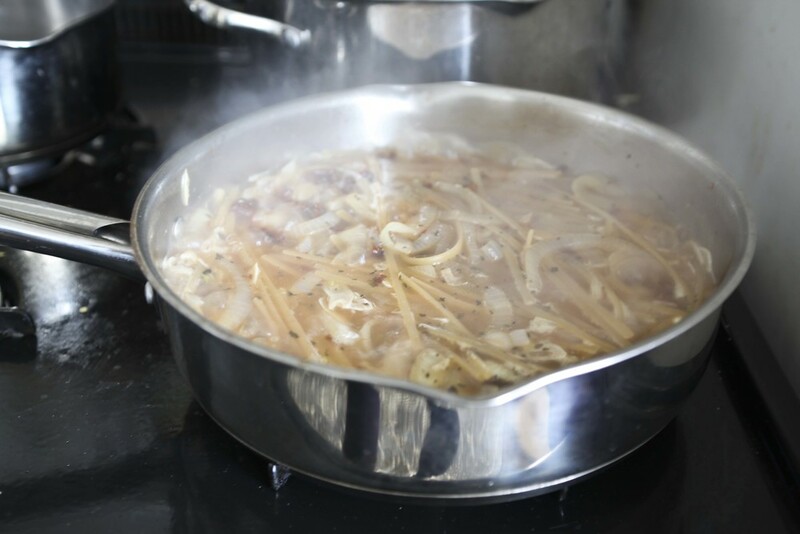 How to make : Heat up a large straight sided skillet, add olive oil & saute onion slices, after a few moments add the garlic. When the onions start to turn translucent or have a little brown on them add tomato & spices, mix. place the Linguini on top & add water. Add just enough water to cover pasta, I also add a little more oil here. Usually I boil water in my tea kettle to pour over the pan. This helps speed up the process.